More than likely, your kitchen is the heartbeat of your home, and we all know just how much wear your cabinets experience every day. If your kitchen needs a fresh look, and a full remodel isn’t in the budget, there is another option. Repainting your kitchen cabinets is one of the hottest painting trends, and for good reason! Let’s take a closer look! 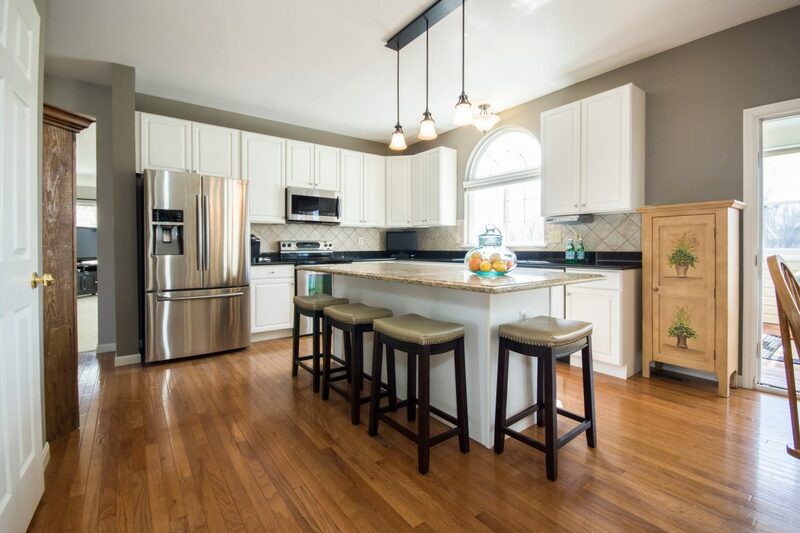 One of the biggest benefits the refinishing process offers is that it can be completed at a much lower price point than buying and installing new cabinets. Unless your cabinets are in bad condition, or the kitchen layout no longer mean your needs, all they may need is some TLC. A Pro Makes Refinishing Easy! There are so many fun options for refinishing your cabinets. Your local professional painter can help you choose the perfect color for your kitchen updates.They can even suggest custom mixes, stains, or paints that will perfectly complement the rest of your home. In fact, one of the biggest benefits of hiring a professional painter is that they will be able to lend you their professional eye to help you achieve the perfect look for the heart of your home. Ready for a few more reasons to consider painting? Durable – Your cabinets work hard, facing physical traumas, food, moisture, and other various sticky substances found in kitchens. The right finish will protect them for years. Speed – Cabinet painting is much quicker than a full remodel! What’s not to love about that? Cleanliness – Although the process still calls for careful prep, masking, and surface protection, the impact is still much less than that of a full remodel/construction zone. Kitchen cabinet refinishing needs to be done by the right pro. Not everyone will have the skills or knowledge needed to get the job done right. A.G. Williams goes above and beyond to meet your needs and leave you satisfied. Contact us today to get an estimate on your next interior painting project. Kitchen Cabinet Painting:What Questions Should You Ask? Easy Ways To Update Your Kitchen: No Remodeling Required!